Via America’s Lawyer: RT Correspondent Brigida Santos joins Farron Cousins to discuss how Kansas is grappling with over-crowded prisons and a shortage of corrections officers. Farron Cousins fills in for Mike Papantonio on this episode of America’s Lawyer. Farron Cousins: An entire correction system is in crisis as the Kansas Department of Corrections declares a state of emergency. RT correspondent Brigida Santos joins me now with that story. So Brigida, what exactly is going on in the state of Kansas? Brigida Santos: Well as you said, the Kansas Department of Corrections has declared a state of emergency at the Eldorado prison where overcrowding and severe staff shortages have resulted in utter chaos. Since 2017 officers have been quitting in droves. They’ve seen 8 work shifts, increased to 16 hours. Officers are so overworked that they’ve reportedly fallen asleep on the job and even forgotten to lock the doors. Now, on several occasions, prisoners have set fires as a result, broken windows, and even seized control of entire areas of the prison. So things are completely out of control. Farron Cousins: So are the problems in Kansas prison system limited to just one single site or is this more widespread? Brigida Santos: Absolutely not. It’s widespread. The problems at Eldorado are representative of problems across the entire states criminal justice system. The Kansas prison population is way over capacity and the correction staff turnover rate is 54%. Things have gotten so bad that the state is now being forced to address this pervasive problem. Farron Cousins: So former Kansas governor, Sam Brownback and Republican legislators, they approved a controversial and unprecedented agreement to hire CoreCivic. Tell us about CoreCivic and how much this is going to cost the taxpayers. Brigida Santos: Sure. CoreCivic is one of America’s two largest private prison companies. Before leaving office, Republican Governor Sam Brownback approved a $360 million agreement with CoreCivic. Under the deal, the company would rebuild an aging Kansas prison facility and then rent it back to the state for 20 years. The deal is more expensive than if the state had just kept the old facility up and running. 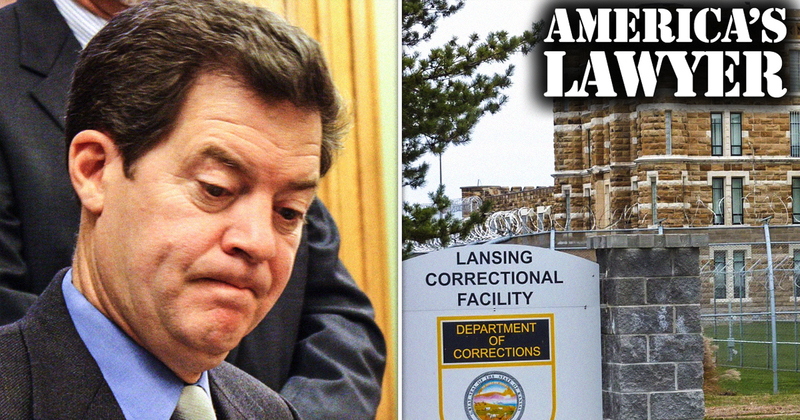 Brownback had claimed that it would save Kansas millions of dollars in the long run, but in order to save money, the renovated prison would have to house more inmates than the old prison and employ half of the staff. That combined with Brownback’s tax cuts have left the system completely strained. Those tax cuts greatly reduced funding for criminal justice programs, including mental health services, drug programs, and health care. And right now, Kansas can only afford to treat 43 of 600 inmates who recently tested positive for hepatitis c because the state still has not paid the contractor that it pro, that it hired to provide healthcare to inmates. So those are just some of the problems that they’re facing. Farron Cousins: Wow. So who benefits from this shift towards the private prison companies who were basically becoming government landlords now? Brigida Santos: Well, it’s certainly not the taxpayers or the inmates. CoreCivic is going to be the one to benefit. It pays for the prison’s construction and the property, which the state is now contractually obligated to lease. Since 2013 private prison companies have really ramped up this landlord business model. And that’s because they know that real estate investment trusts are just companies that own and operate income generating real estate. So by acting as a real estate owner, private prison companies can avoid paying taxes by claiming that their main source of revenue is generated by owning real estate, not by jailing people. Farron Cousins: So the Kansas, Kansas legislature is also considering formation of a panel to study and recommend changes to the state’s criminal justice system. What can you tell us about that? Brigida Santos: The House Bill 2018 has been introduced to reform the entire Kansas criminal justice system. It aims to review the system as a whole rather than as a set of individual issues, and if it passes, the bill will allow a commission of lawmakers, law enforcement officers, judges, lawyers, advocates, and mental health providers to review criminal sentencing procedures and create new programs aimed at reducing incarceration rates and increasing diversion efforts. Farron Cousins: Brigida Santos, thank you very much for telling us the story today.